The Honors student and anthropology major won top honors for his research of Quechua myths in Peru. Melina Oliverio '16 was named first runner-up for the ASIANetwork's Marianna McJimsey Award, which recognizes top student papers focused on Asia. Six panelists met with members of the Alamance County community Thursday night in a public forum where ideas were shared to better portray the realities of life for those who receive public assistance. 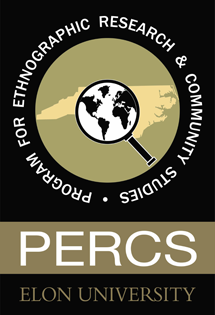 PERCS now offers students with the opportunity to earn a certificate for excellence in ethnographic research! Learn more here! A panel of undergraduate researchers led a discussion on Ethnography Across Disciplines at the Spring Undergraduate Research Forum (SURF) during Celebrate Week in April 2015! Click here to check it out! Aunchalee Palmquist, Assistant Professor of Anthropology and Director of PERCS published a chapter in Ethnographies of Breastfeeding: Cultural Contexts and Confrontations, Edited by Tanya Cassidy and Abdullahi El Tom. This chapter draws upon data collected as part of Palmquist's study of internet-faciltiated breast milk sharing. PERCS is working to examine the system of public assistance in contemporary and historical contexts. Members of PERCS conduct fieldwork in Alamance county to record the stories people share about their views and experiences with public assistance. Check it out. Amy Allocco, assistant professor of religious studies, has been conducting ethnographic fieldwork in South India for her book on contemporary Hindu snake worship traditions. Read more about Hindu Worship Traditions.